I have had my eyes on this sweet radar detector for a while and just noticed that the price has dropped quiet a bit than what it was going for before. A quick check on Google Products shows that this is going for atleast $130 elsewhere and even more at reputable online outlets. 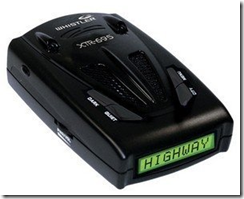 However, Amazon has the Whistler XTR-695 Laser/Radar Detector for $99.99 with free shipping. Of course, if you want to really go all out, don’t forget to check out the Whistler PRO-78 SE High-Performance Radar Detector with Blue Text Display .